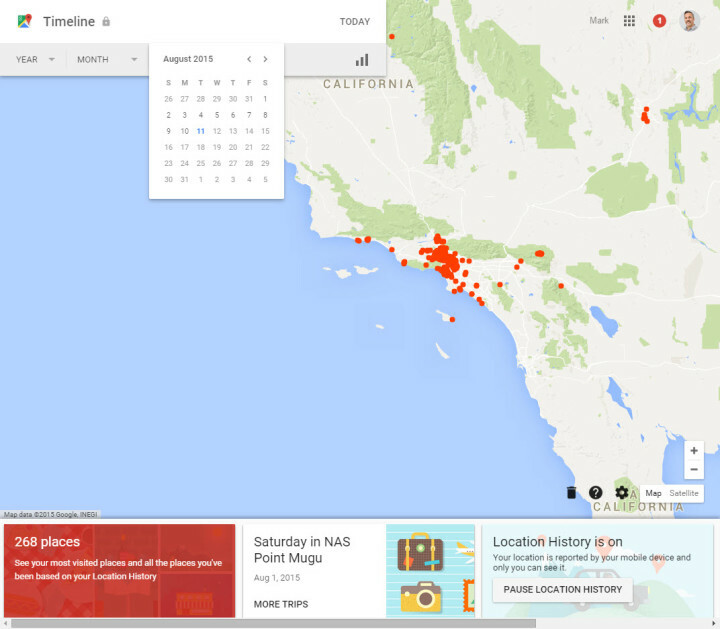 Google recently announced a major new update to their Google Maps product called “Your Timeline”. This new features provides lots of new insights beyond the previous location tracking history they already provided. The announcement states that it’s currently only available for Web and Android but I’d imagine IOS will be available soon. The first thing you need to determine, if you don’t already know, is if you have Google location history turned on. You can find this for web or Android here or get details for IOS here. If you haven’t turned it on, you can determine whether you want to based on your comfort level with Google having this information as well as learning more about the features it will offer by reading the rest of this post. Accessing the data and using it’s features are slightly different between the web and the app. I’ll be discussing the web version for simplicity since it’s universal and has some additional features over the mobile app. It can be a little tricky finding the page. The quickest way is by visiting this link. But here’s the manual way just in case. 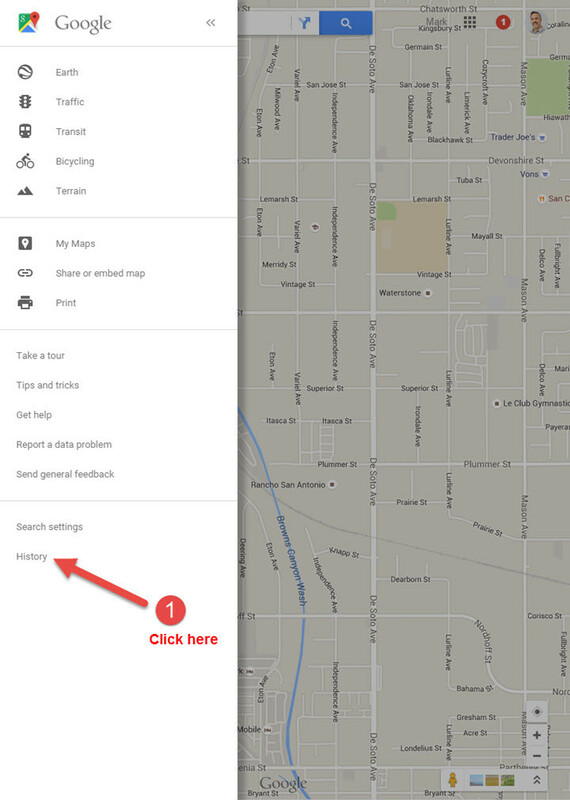 First make sure you’re logged in to Google and then visit the Google Maps page. Once there click on the hamburger icon (3 horizontal lines) on the location bar which will expand a menu. From here you want to scroll all the way to the bottom and click on the word “history” which links to your complete Google history page. From here you can click on “location history” from the options on your left. Finally after all that you will be on your Google location history page. I had location tracking as of April of 2012 and because of this had a pretty rich history to provide the features that I’ll be showing you. First off you can navigate your location history by going to any given day you want using a calendar or drop-down menus. Once you visit a specific day you will get a chronological timeline of that day showing all of the locations you visited and for how long you were at each of them. Visually you will have a standard Google map showing a visual trail of the path taken to each of your locations shown on it . If you are using Google Photos you will now see images in-line with the locations that you have visited in your location history. This is a fun way to remember a given day by not just having the photographs, but the context of your travels for the day. In some cases if Google isn’t sure of the exact location they will provide a best guess showing the name with a confirmation button titled “I was here” (“yes” button on mobile) or you can click on a dropdown menu (“edit” button on mobile) that will show other nearby locations which you can select to correct the guess. This is helpful when visiting locations in mini malls or other dense area locations. In these cases the photos can provide a visual way to help you determine these unconfirmed locations which can at times be a little tricky to remember. 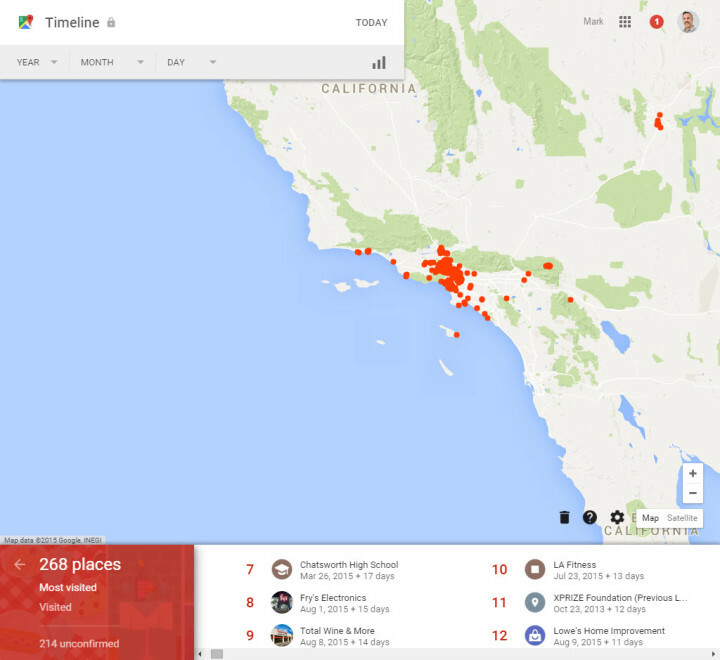 Another way you can navigate is by viewing a map full of red splattered clusters signifying every location you’ve visited. You can then zoom into these clusters and as you get closer they will begin turning into dots signifying locations you have visited. You can then click on the dots to get the location information represented by it and if you click the name of the location it will load your location history for what appears to be the last day you visited the location. Below the map is a strip with several boxes that display additional items linking to specific features. The first box listed displays the total number of unique locations you have visited. You can then click on the box and it will display your top 30 most visited locations. As expected home and work top the list but you may find some interesting surprises or omissions as you view the list. Earlier I mentioned the unconfirmed locations. On this page you will see a total number of all your unconfirmed locations with a link. Clicking on the link will bring up a list of these locations. By reviewing these and either confirming or updating them with the actual locations you will improve your location history and in turn these places may begin appearing in your top visited locations. There are many other small features that you will discover as you use this service. I noticed that it recognized a trip I took and broke that out with the individual days as a separate way to navigate it. I’ve found this service to be useful in many ways such as helping me remember locations I may have forgotten visiting or as a way to reminisce past trips. These updates are great and I’m looking forward to them continuing to improve this over time. Hey Mark; I agree it is nice and useful; but do you know how to view the distance traveled on any of those blue lines. I’m not aware of how to get the values for the distances traveled. “Distance traveled” seems like it would be an obvious value to display when tracking one’s movements. But I can’t find any way to display it either. Wish this were an option. 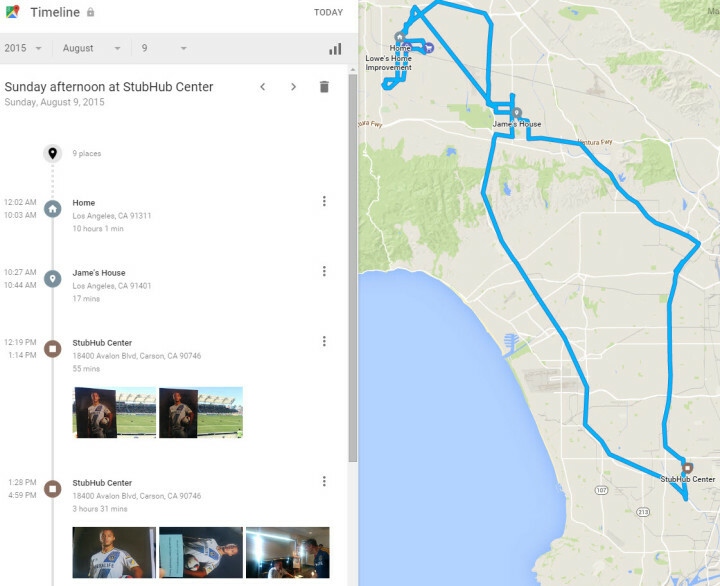 I’m seeing an animated blue line quickly bolting across the top of my google maps, can anyone tell me what’s going on? It feels like it’s trying to alert me to something, but I can’t find any info on it.